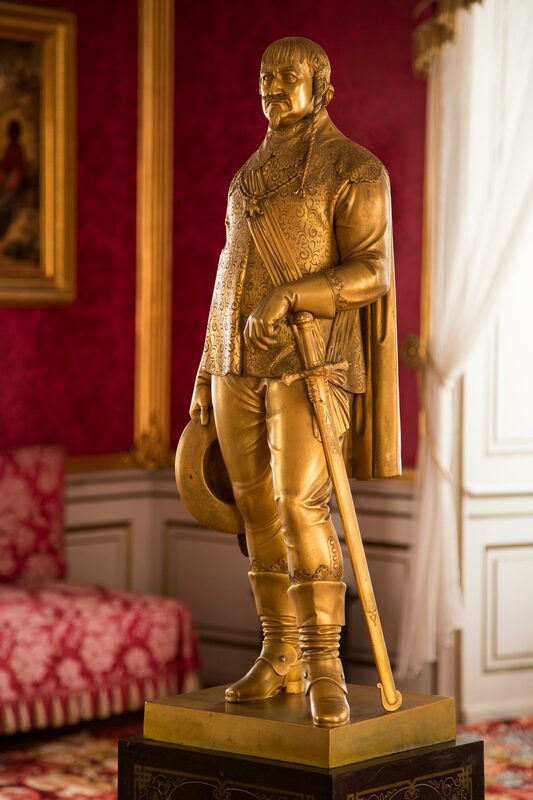 The statue of Christian IV is gilded bronze, made in the 1840s by the craftsman Jørgen Balthasar Dalhoff (1800-1890). The figure is a smaller model of a large statue of the king made in 1840 for Roskilde Cathedral by the sculptor Bertel Thorvaldsen (1770-1844). The iron plinth with inlaid, gilt figures and silver inlay was made by Dalhoff in 1853. The figure and plinth were originally in the chapel of Frederiksborg Castle, but after the fire at the castle in December 1859 it was moved to the Audience Room at Jaegerspris Castle.